The dreaded essay: the least favourite assignment for many students, whether in public school or homeschool. Intimidating though they may be, mastering the ability to write insightful, well-thought-out prose is an asset that can be applied to just about any professional job from engineering, to law, to copywriting. It’s important to help your child write essays well, as it’s a life skill they’ll need for years to come. My dad often encouraged my interest in writing by saying that I’d do well at any job I picked if I could write well. Even as an engineer, he knew the value of good communication. In today’s online world, the ability to communicate well remains important. Essay writing is a facet of school life that many students admit they struggle with. Yet, if your child plans to attend post-secondary education, essay-writing is a must-have skill for succeeding academically. I made it through my biology class on the strength of my writing skills alone. Many scholarship and bursary applications also ask for a written essay. Here are a few fundamental tips you can share with your kids next time they lament they have yet another essay due. 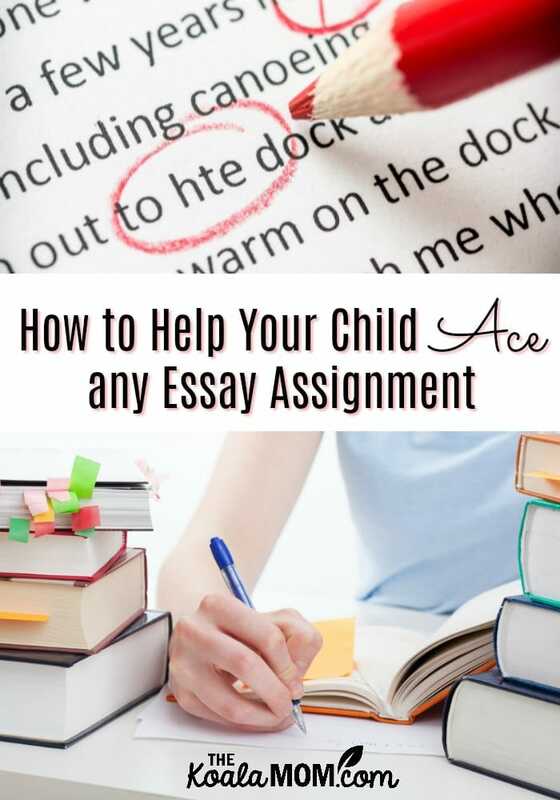 Even if your child hates to write, they can learn to produce a well-written essay. Help them master this life skill now, and they’ll thank you for it later. As you help your child write essays, start with the most important thing every writer should know. Most people, even the most talented writers, can’t simply start typing away and produce something meaningful without at least organizing their thoughts. That’s where the outline comes in. If your child is staring at a blank page, stumped about what to write, help them get a big-picture vision of their essay. Think of an outline as a blueprint. Instead of using it to construct a building, you’ll refer to your outline to build a solid essay that covers all the points you wish to make. To write an outline, start by writing your title at the top of the page. Add the major topics you’d like to include, leaving a few lines beneath each for bullet points. Before you know it, you’ll have the conceptual building blocks to crafting an organized, cohesive essay. Another way to write an outline is to make a mind map. Write the title or topic in the middle of the page, and put a circle around it. Then have your child jot their ideas in other circles around the main circle. They can draw arrows to show how the ideas relate to them. If your child is more creative or likes doodling, this may help your child write essays better. Sometimes an argument looks strong in your outline but is less than compelling when you start putting pen to paper. Consider talking through your major points with classmates or family members to get their take. They may see an angle you haven’t considered, or a big hole in your thesis you didn’t see. During university, I enjoyed connecting with fellow classmates about our papers. In fact, one of my first conversations with the guy who became my husband was about our Religion 150 assignment. I had a vague idea about what I wanted to say; hashing it out with him verbally made me ready to sit at my computer and write my paper. If your child is struggling with what to write, help your child connect with a classmate to discuss the essay. A friend who is taking the same class may have another point of view about the topic. This new perspective may help your child write the essay more quickly or effectively. If you homeschool, you could talk to other homeschooling parents about forming a writing group or having your children write essays together on similar topics. Recently, my oldest enjoyed doing a video writing class with a few other homeschool students. She and another girl in the class wrote their essay together, chatting via Zoom and phone. These types of dialogues can help you flush out your supporting material and see where an original idea might not pan out. If you’re a parent, and you’re busy, or want to provide your child a bit more help to chat about their essay, look into working with an English tutor. You might be so caught up on sounding smart that you keep a thesaurus close at hand whenever you’re writing; maybe you reference it often. However, sometimes the sentiments of a good argument doesn’t need a fancy verb or synonym. Even though a repetitive sounding paper can be a deal breaker, write your ideas in your own voice. Bring in a good editor like a friend, a relative — or even just yourself reading out loud — for that first draft. This can sharpen and refine your finished paper. Always focus on getting your point across with clarity. Avoid using big words like “utilize” when you can just say “use.” Then think about how you can edit to make the argument sound a little more sophisticated. The worst thing you can do is not give yourself enough time to get the job done right. Writing right up to the deadline doesn’t give you time to proofread and edit your work for good spelling and grammar. Both these steps are key to professional, strong essays. Help your child write essays by encouraging them to set deadlines and stick to them. While it’s not easy, “tricking” yourself with a false due date can provide some level of anxiety and pressure to finish the essay. This then gives you an extra day or two to review your work, and identify ideas and sentences that can bring down the entire thesis argument. In university, I always wrote a note in my planner to start my papers at least two weeks before they were due. Often, if you can let your essay sit for a few days before coming back to it, you’ll notice errors that you missed before. You may also have some new ideas to add to your essay, because your brain has continued to think about the topic since you wrote it. Learning to write with conviction and clarity is an important communication skill to have. Taking a bit of extra time at the outset to plan the work, and then scheduling in extra time before the submission date to edit and revise, are strong components to success. And while finding time is hard, it’s essential to success and providing confidence.